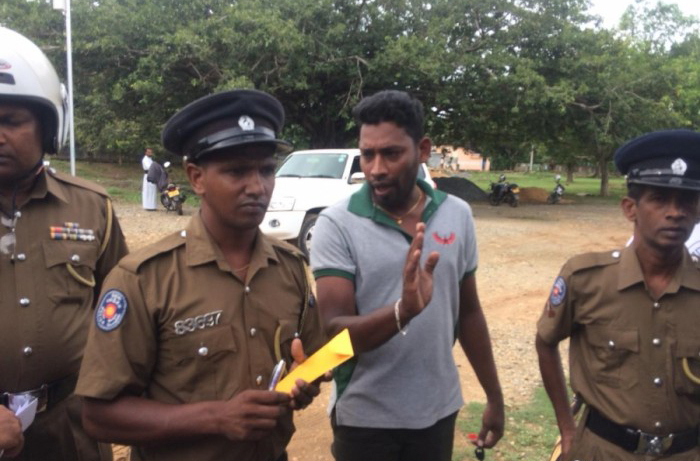 LEN - www.lankaenews.com | Sivajilingam and Anandhi who went to construct dead LTTE leader’s statue chased away ! (Lanka e News -08.Oct.2018, 11.00PM) Provincial Council (PC) politicos Sivajilingam and Anandi Sashisharan who went to construct a statue of a former LTTE leader Pullendiran at a playground in Thuruvil, Velvettithurai , Jaffna were chased away by the youths of that area. The youths who demonstrated their opposition on the 6 th have summoned the Police. 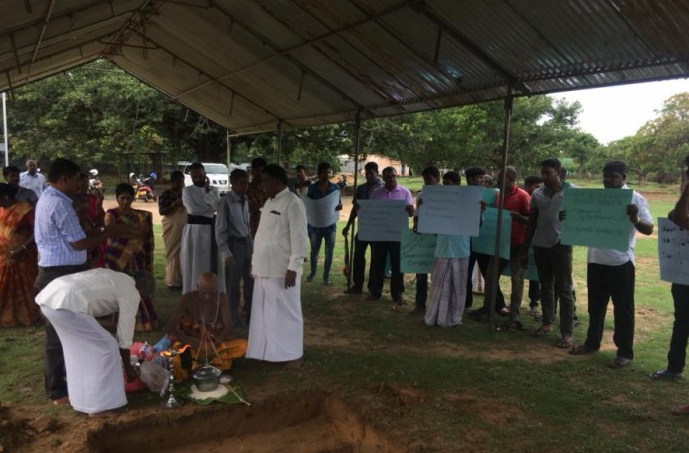 This opposition was mounted by the youths when Sivajilingam the TNA member and minister Anandi Sashiharan of the Northern PC tried to build a statue of Pullendiran a former LTTE pradeshiya leader at a playground in Thuruvil , the latter’s place of birth . They had selected 6 th of October for this because it was Pullendiran’s birthday. Sivajilingam and Sashiharan had undertaken to complete the construction of this statue to have it ready for unveiling on the ‘Heroes day’ which falls on 27 th November . 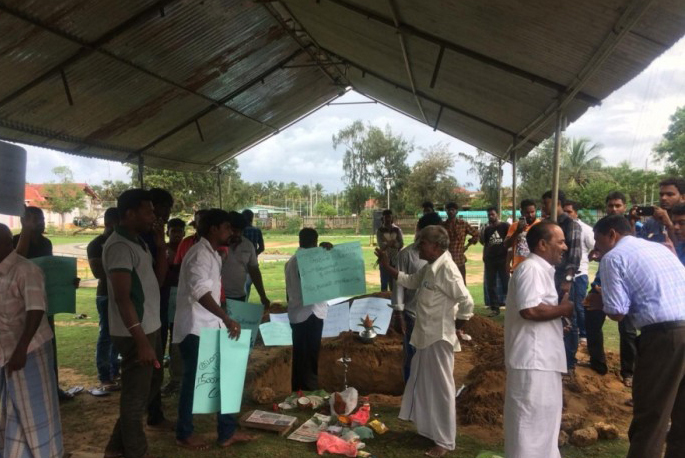 An auspicious time had been selected to lay the foundation stone and the permission of the Velvettithurai Municipal council had also been obtained. 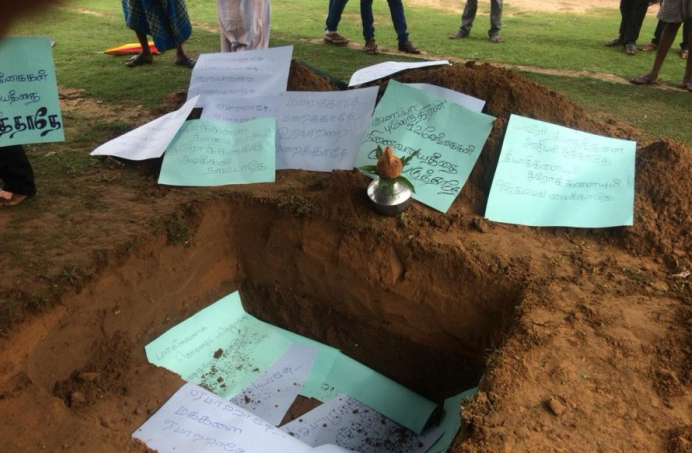 Yet when they were getting ready to lay the foundation stone , a group of youths of the area have suddenly appeared and objected to it. They have told , the politicians have no reason to commemorate the dead Tigers and had asked those present to leave. The widow and family of Pullendiran had also been present to participate in the foundation laying ceremony. They too were told by the youths that if they wish to have a statue of Pullendiran they can erect it in their home. 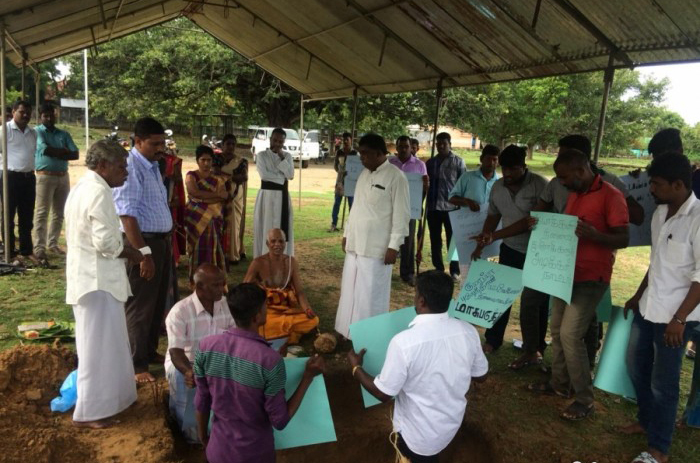 The Hindu Kurakkal (priests) who were there to conduct religious ceremonies when the foundation stone was being laid had also been asked to leave the venue by the youths who have put the posters into the pit that was dug and protested against the construction. 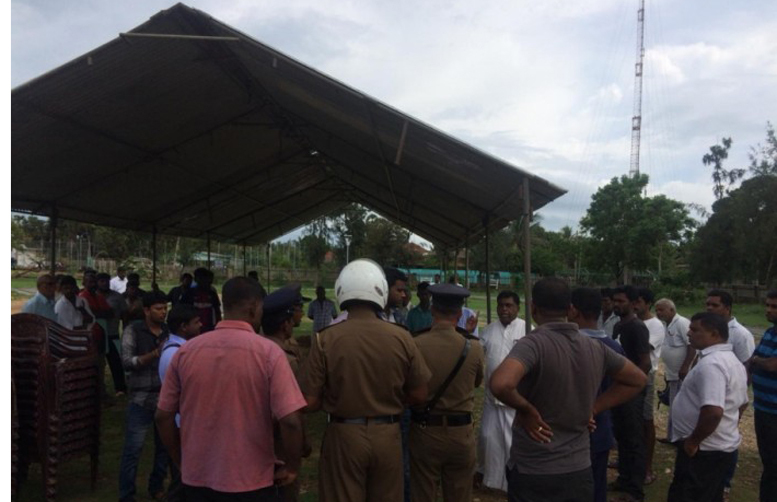 A dispute had then erupted between Sivajilingam and the protesting youths , and as tension was taut , another group of youths had immediately gone to Velvettithurai police and fetched some police officers to the venue . Following the arrival of the Police the tension was defused . Thereafter the PC minister and PC member as well as the organizers have left the venue.